This is the burning question that rises up in me whenever I sit in an arts advocacy meeting, and it is the same question that arises when I step on the dance floor. As artists, administrators, culture workers, and professionals with “many hats”, we often learn to “lead” by necessity without exploring the nuances of leading within diverse communities, or confronting what it might mean to follow instead of lead. Learning the techniques and culture of social dance has given me vast insight into the opportunities and challenges of leadership in a way that I have never experienced in traditional professional development workshops, and I want to explore these concepts further through an embodied workshop with other participants. Through the lens of movement, partner dance, and an introduction to tango, this workshop will explore alternate understandings of “leadership”, core issues of trust, and the role of regenerative practices in creating a healthy, sustainable, and creative life. 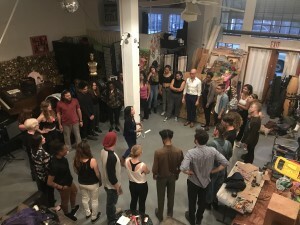 The workshop will use tools and techniques from Argentine Tango and Salsa Rueda, two highly social dance forms, to explore leadership, connection, movement building, and the ways in which one moves through the world to affect social change. If successful, it will be both fun and fulfilling, easy and inspiring, playful and profound. No dance or leadership experience is necessary; the workshop will be tested and designed to be welcoming and accessible to all. Cristina Ibarra wants to rock your world. She knows the arts are a great way to do this and has dedicated the last ten years to empowering artists and youth to use their talents and creativity to inspire us all. She’s an enabler. She’s an administrator. She’s an artist. She’s a facilitator. Whether in the space between a tango embrace or a ukulele chord, behind an office desk or in front of an audience, Cristina’s mission is to help people connect with themselves, the world, and others around them through the sublime experience of art.